Here's a new idea I came up with, photo bookmarks. That's my husband, Jason who reluctantly posed for the picture. The conversation went something like this. Me, "Jason come over here, I need to take your picture". Jason, "What's this for anyways". Me, "Don't worry, it's just for the blog". Jason,"That's what I was afraid of". 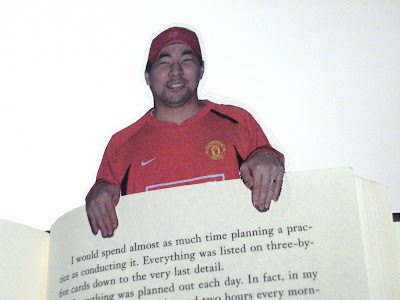 But there he is, in all his bookmark glory. This craft only takes about 10-15 minutes to make. 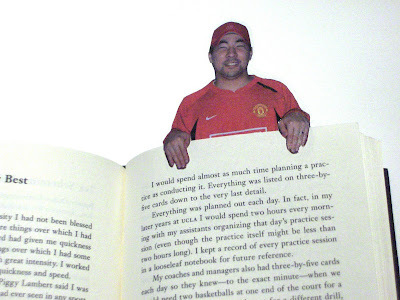 It would look great to make the person climbing into the book as well. I would have taken a picture of this but I didn't want to push my luck. Directions below. 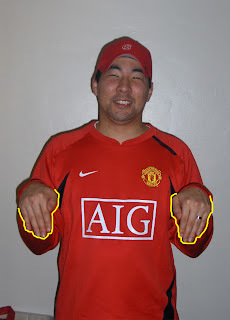 Take a picture of someone doing this pose. Print on medium weight card stock. Cut out the body. Laminate with contact paper or laminate paper. 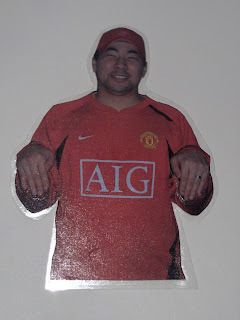 Cut out of laminate paper. With the exacto knife, cut where the yellow lines are. This is a great idea - I love it. Interesting. I really like your blog. The bookmark is really fresh! I think I must add you to my blogroll as my favourite site. This is such a cool idea! You are such a crafty lady. And kudos to your DH for posing for the photo. That is a great idea and very funny. It would make me chuckle every time I reached for the book. Haha. Your husband is such a good sport! I haven't started a blog yet, my website gets neglected enough. I checked out your etsy site, like the merman and mermaids. Also visited your website, looks great. I was browsing through your posts and loved them all, but this is (up until now ;-)) my favourite. Thanks for sharing such a new idea with us. I hope this idea will useful for the visitors. Keep sharing like this.